I am so excited to introduce you to Ally from The Vintage Valley. A vintage lover, stylist and blogger than has such a beautiful presence in the online world. I first found Ally on Instagram and immediately turned into a stalker! Hitting like on photos that were over a year old but I just didn’t care. Her vintage style is so beautiful and complimented so well by her husband with his suave mustache, vintage hats and shirts. But more important than that is the good vibes and passion that comes through Ally’s posts. Her love of vintage was inspired by her family. Growing up in a family of musicians she was surrounded by interesting characters, vintage jazz and dancing. So it isn’t surprising that slowly Ally found her own vintage calling. It came through swing dancing, vintage fashion and hair and makeup. 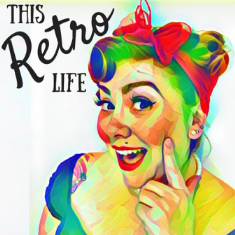 Ally has documented her vintage style as it developed on her blog and now helps others through hair and makeup workshops. What else struck me about Ally is her wardrobe. What a collection of true vintage pieces she has! And for Ally it’s all about courting her clothes. Finding out more about their story, working out if they fit and then “flirting” with them a little bit to see if they need to come home with her. As she has honed her look, Ally now offers other women the chance to learn the vintage ropes! Teaching beginner hair and makeup classes for anyone to learn how to get that perfect vintage do! As if all this wasn’t enough, Ally has also started a great online initiative. It’s called Neat Deeds and is all about making the world a little more awesome through easy tasks like leaving a book for a stranger, paying it forward, sending some clothes to an op shop and so much more. It’s such a fun little project to be a part of and you can get involved online by sharing your neat deed! It was such a pleasure to sit down with Ally for our latest episode. Make sure you subscribe so you can listen back to previous episodes and never miss our future chats!